Cover, title page and preface of the booklet "Full Particulars of the Late Riots". Engraving of American flag. 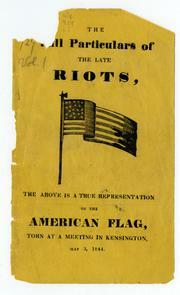 Caption: "The above is a true representation of the American flag, torn at a meeting in Kensington, May 3, 1844." "The full particulars of the late riots, with a view of the burning of the Catholic churches, St. Michaels & St. Augustines," Philadelphia : [s.n., 1844].